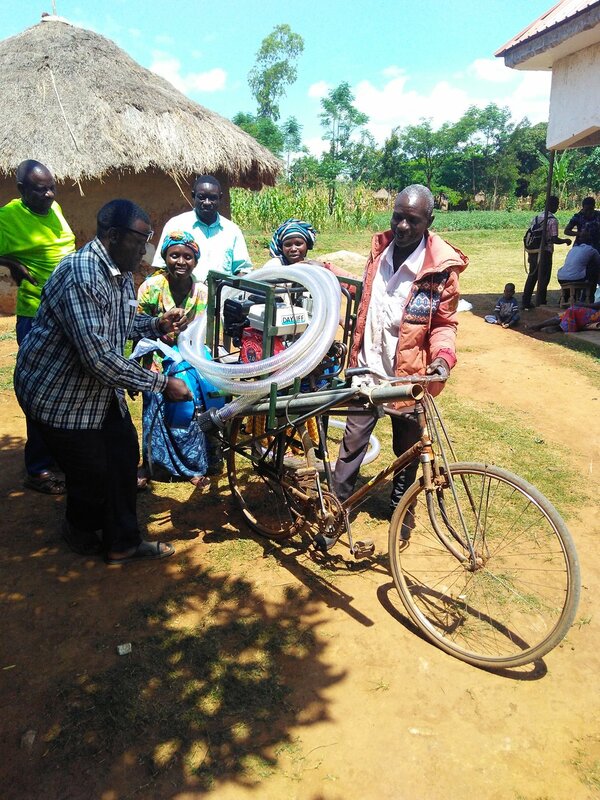 Goden Nuwamanya, a project assistant and former Busitema University intern, demonstrates design adjustments to his water-powered pump for delivering irrigation water to upslope plots. Farmers consult with student interns on the design and construction of new equipment and systems tailored to address farmers’ needs. Being near to the Uganda-Kenya border, trade in vegetables active in the Tente area and well known to farmers, who often target their production to take advantage of high prices during the dry season. Farmers in Tente have traditionally used manual irrigation methods, either watering cans or wash basins, to throw water onto plots neighboring their stream. The Innovations in Dry Season Horticulture project is hosted by an existing farmer group, Tente FFS. Over the course of the project, a subset of Tente FFS members have formed a smaller irrigation group sharing a plot of land next to the stream. Tente is located in southeast Uganda, very near the border with Kenya. It is part of Uganda’s Bukedi subregion, which encompasses a range of farming systems and agro-ecologies. The landscape around Tente is characterized by broad, flat ridges with moderately steep, narrow valleys. Major crops in the area include maize and beans, as well as sweet potato, cassava, and rice in the valleys. Fishing is a common activity in the south of Busia district bordering Lake Victoria. Soils range from sandy loams to clay loams, over lateritic or clay subsoils. Farmers at Tente have collaborated extensively with Busitema University students to pilot and refine students’ irrigation innovations. These include the water-powered pump pictured above. Students and farmers eventually agreed to halt development of this pump due to the engineering challenges in generating sufficient pressure to deliver water over the upslope lateral and vertical distance. However, the iterative design and testing process brought farmers and students together to identify the opportunities and constraints in innovating irrigation solutions at the Tente site—a process that has continued to stimulate creativity and fuel the group’s efforts in developing other technologies. In place of the water-powered pump, Tente irrigation group members determined that they could raise enough funds for fueling a small engine-pumped water system. Since the irrigation group is composed of four sub-groups, the farmers have worked with our project team and students to develop a mobile solution that can serve all four groups: a modified bicycle outfitted to carry the pump, pipes, and sprinklers from one subgroup to the next. 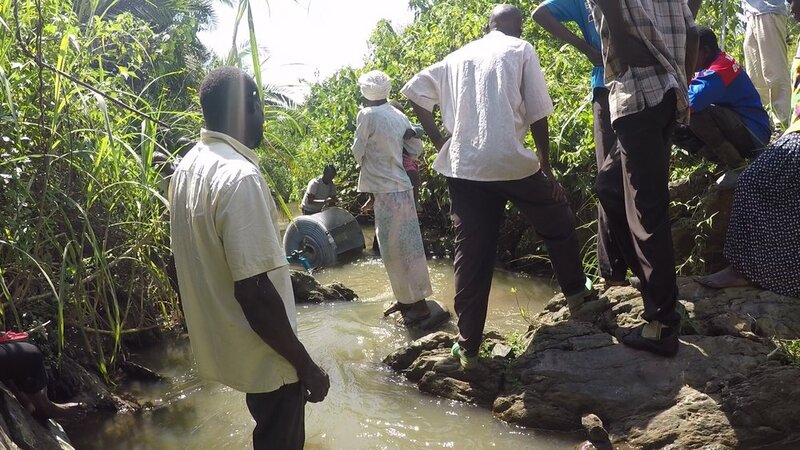 Labor required to move water from the stream to the irrigated plot is a significant challenge for farmers at Tente, especially because group members are dispersed over a large area and installing a stationary piped system may only reach a few individuals. Many of the innovations piloted here have involved ways to address this challenge. A mobile irrigation system comprised of a small-engine pump, flexible piping, and a sprinkler set has improved access to irrigation across the group, especially for members who would otherwise be required to descend a steep slope down to the stream. Students, farmers, and project engineers are currently working to establish a small reservoir for water storage. Members developed a custom excavator tool, powered by locally-available animal traction, for digging the reservoir. Student interns and project engineers are currently conducting trials of different formulations of affordable local clay sealants to prevent loss of the water into the surrounding subsoil. Shareable—and moveable—irrigation. Farmers at Tente hand off the bicycle-carry irrigation system, which is maintained by the irrigation group and circulated among members.